I love buying dresses and skirts, if I happen to stroll into a clothes shop I'm drawn to them immediately. I tend to only ever bother looking at trousers if I happen to desperately need a new pair of jeans. The silly thing is I then spend most of my life living in jeans and so my beautiful dresses and skirts sit in the wardrobe waiting for a special occasion. This is really rather silly of me so I've decided to make more of an effort to wear more of my wardrobe. My birthday fell in the category of "special occasion" which meant that abiding by my own Chloe logic it was a day I could reach for a skirt. This leather style skater skirt was a present I got for Christmas. I'd been hunting for the perfect piece of "leather" for my wardrobe for ages. I loved the trend but it was hard finding something that was flattering to my figure as leather is very unforgiving. I eventually found this flared skirt in New Look and it was a perfect flattering fit. Next was deciding how to style it! I knew I wanted to wear it with something soft and fluffy but it took me a good few months to find something that was just right. I stumbled across this gorgeous pink cropped jumper in the Topshop sale in Fenwicks a few weeks ago and it was exactly what I'd been looking for. Cropped jumpers are something that I've always avoided before, thinking that they'd look terrible on me and emphasise my bum and tum which are areas I don't particularly want people to notice. I now have a new found love for them though because they are perfect to wear with the right skirt. This jumper is pretty short so obviously now that I'm over 30 and therefore have become slightly sensible I did wear it with a pink vest top underneath just to ensure that I didn't expose my midriff to all of Newcastle and also to keep me nice and warm. As I mentioned in my previous post I spent a lot of my birthday loving all thing mint green after painting my nails a lovely shade of Tiffany and putting on my statement necklace I bought in a haul last year. I finished my birthday outfit with a pair of boots I bought in Primark back in the Winter. I adore the little gold features. This outfit was definitely something new for me, it was my first time wearing leather and a cropped jumper, but I really loved it, I will definitely be wearing this again soon. Hi Chloe, you look lovely!!! The cropped jumper really suits you; I think with that kind of thing its more about the proportions of your body and making sure you chose the right one with the right skirt as you've done perfectly here! Ah, you look great! I love that outfit! 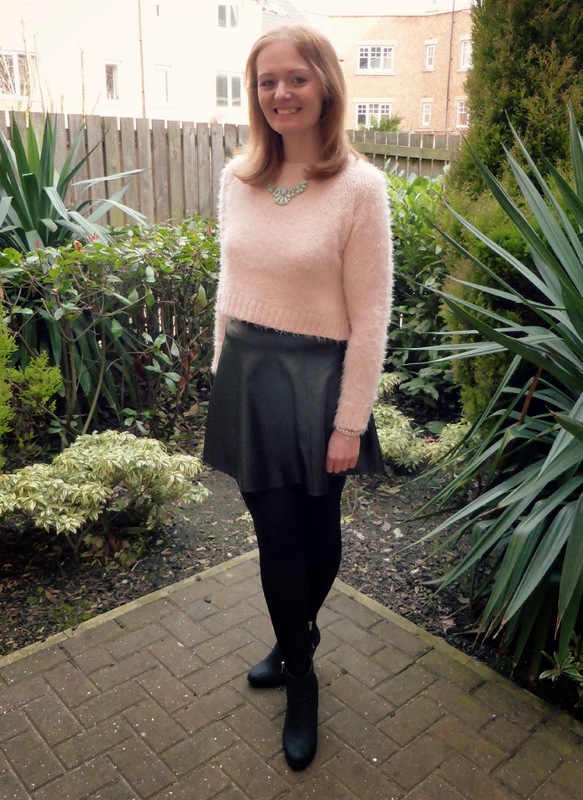 My husband chose and bought me a leather skirt from All Saints at Christmas, it's similar to yours, and I love it! Looks so good paired with jumpers and also casual t-shirts and tops. Love the leather and fluff combo! :p Lovely colour pink on you too! Loved this outfit when I saw it on your birthday post the other day - really suits you! Plus I love the combo of textures. Thank you :) I really should make an effort to put a skirt on more often! Happy belated Birthday! You look gorgeous. I love the combo black and pink. I also love leather, but I find it difficult to match. You have done a good job! I love your outfit. You look really good in the leather skirt. I have a leather mini that I hope I can fit into one day soon. I've been searching for cropped jumpers to wear with a couple of skirts but I'm really struggling to find any. Thank you :) Topshop have a few in the sale, I picked mine up from their sale rail in Fenwicks, but also spotted they have more in the Eldon Square branch. 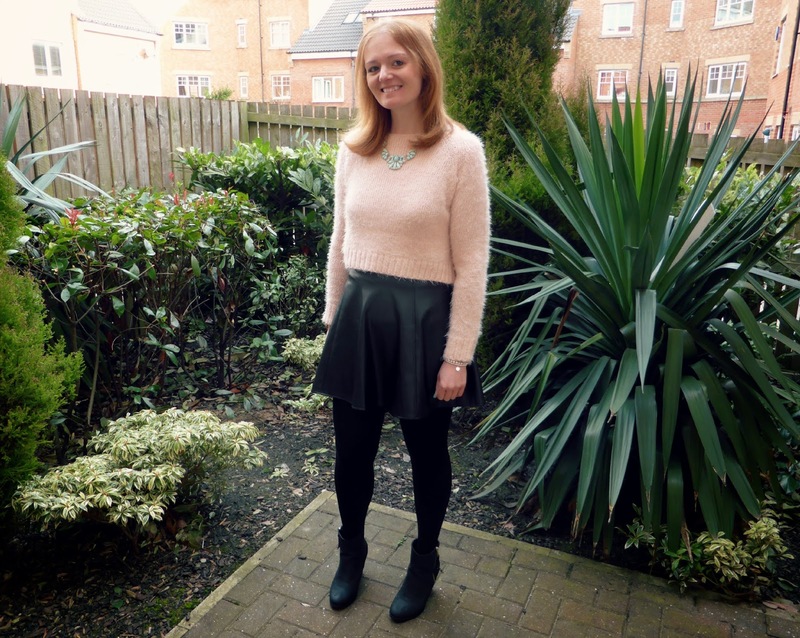 Also, I was in the big Tescos in Gateshead at the weekend and tried on this which I loved - http://www.clothingattesco.com/knitwear/f+f-jumbo-cable-knit-cropped-jumper/invt/bm412356&bklist=icat,4,shop,catgwomens,womens-knitwear Just looking at the website and they have even more on there, loads of different colours and styles and really cheap!